These maintenance tasks improve energy efficiency, and some help prevent odors. NOTE: The tasks and timings shown here for your Refrigerator/Freezer are based on a single-family home (owned), located in Massachusetts, United States, with priority set at ‘1 star' or higher, for all possible goals. If you set your personalization differently in your Home Wizard app, then you may get reminders for different tasks and timings in your recommended home care program for your Refrigerator/Freezer. Vacuum condenser coils: For most refrigerators, the heat exchanger coils are underneath the refrigerator, and for some models they are along the back of the refrigerator. For models with coils underneath, there is an access at the front of the refrigerator at the bottom. This panel pops off, and allows you to clean the heat exchange coils using one of your vacuum cleaner attachments. As the coils become covered with dust, the dust acts as insulation, making it harder for the coils to exchange heat, which therefore makes your refrigerator have to work harder, costing more to operate, and reducing its service life. Since the kitchen is a "high-traffic" area, a lot of dust will tend to accumulate under your refrigerator as rising heat causes air to be drawn past the heat exchanger coils. Clean drain hole and drip pan: Refrigerators typically have a drain hole and a drip pan to catch water condensation. According to your manufacture's recommendations, clean any food particles or deposits out of the drain hole. Clean the drip pan in soapy water to prevent bad odors. Clean and check door gasket: Check the door gasket for cracks, breaks, or brittleness, and replace as necessary. To test the seal that the door gasket makes: close the refrigerator door on a dollar bill; if the dollar bill can be pulled out too easily, then so will the cold air inside the refrigerator; repeat the procedure at four or five locations around the door, and the same for the freezer section if this has a separate door; if the bill slips out too easily, you probably need to replace the gasket. Clean door gasket with detergent solution; rinse and clean. Clean/defrost inside of refrigerator: Clean the refrigerator compartment regularly, even if it does not require defrosting. To clean, turn off the refrigerator and empty. Remove all food and the interior parts that can be removed. Wash the inside compartment with a solution of 1-2 tablespoons of baking soda in 1 quart of warm water. Rinse and wipe dry. Follow your manufacture's instructions for cleaning plastic drawers, shelves, etc. Otherwise, wash with a mild detergent , or the baking soda and water solution. NEVER use abrasives like scouring pads, as these can scratch plastic surfaces. Be careful not to use hot water, as this can crack cold glass on plastic parts. De-frost/clean freezer and ice-maker: Never let frost in freezer build-up more than 1/4". Do not use metal or sharp instruments to scrape off frost, as a slip could cause damage to the inside of the freezer. Clean inside with a solution of baking soda and water. Clean any mineral deposits from the automatic ice-maker, if applicable. Defrosting helps improve the energy efficiency. 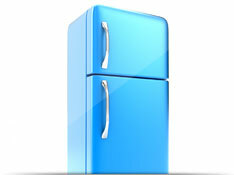 Check inside temperature: If your refrigerator is operating at below 40°F you are wasting energy. To check your refrigerator's temperature, place sensing end of an outdoor-type thermometer in a glass of water that has been in the refrigerator for at least 8 hours (simply putting a thermometer on a shelf in the refrigerator doesn't sense a true temperature reading). If the temperature is below 40°F, then move your refrigerator's temperature control up a notch. Repeat the procedure until the thermometer reads 40°F. Change water filter (if applicable): If your refrigerator has an automatic ice-maker or chilled water dispenser, then you may also have a water filter in the water supply line. The filter in this line should be changed out in accordance with your manufacturer's recommendation. Adjust front support feet: If the doors of your refrigerator do not close by themselves (or close too quickly) then adjust the support feet appropriately. Doors left open obviously require more energy to operate. The benefits of this task are moderately high. In addition to maintaining the energy efficiency of your refrigerator, it will also help to extend its useful life. The cost of this task is relatively high from an investment of time standpoint. It is estimated that this task should take a couple of hours to complete. No specialized tools are required.